Braj is the birthplace of the divine duo Radha-Madhav. Its charismatic supernatural spiritual powers have been felt and perceived by many saints. History of Braj is a testament that saints like Soor Das, Tulsi das, Meera Bai and even Chaitanya Mahaprabhu, Vallabhacharya, Swami Shri Haridas who came to braj had revolutionized the spiritual world by their divine presence and devout powers. The time when the whole country was disturbed by the atrocities of foreign invaders, these holy saints enlightened the whole world by their blissful charisma and showed them the road to spiritual peace and welfare to mankind. In the present time the people of Braj have witnessed and perceived similar divine attributes in Murlika Sharma, who was born in Gahvarvan-Barsana. Her sacred characteristics do signify that she is a divine soul and she has taken birth for the welfare of people. Whenever the material world gets engrossed with tyranny, malpractices and godlessness and proceeds towards doom, then God shows mercy and sends a divine soul on earth for the welfare of mankind. Murlika Sharma was born in an ordinary family and after her birth the house became the epicenter of religious welfare. Shri Radha Ras Mandir is such a devout place where thousands of devotees stay and have Prasad daily free of cost. Murlika Sharma was not fond of toys since her childhood, neither was she very much inclined for good attire and dishes. She was neither too much attached with her parents nor had any friends. She had the habit of staying alone and meditating on the divine leelas. Her parents used to surprisingly wonder on the habits of such a young girl. She was fond of staying close to her Guru Shri Ramesh Baba Maharaaj and loved the company of saints. Her virtues and belief of previous birth did keep her away from all the false attributes of maya. She had her initial education done at Raseshwari Vidya Mandir, but one who is knowledgeable does not require to study about the conventional wisdom and knowledge. She is so devout and detached that she has never aspired for riches and wealth. 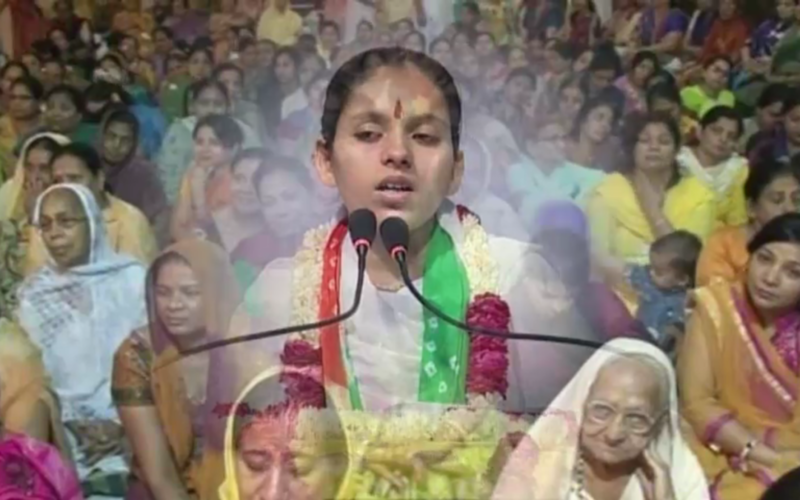 She started saying Srimad Bhagwat Katha at the tender age of 10 yrs. It surprised all. People today are lost in material aspiration and have forgotten about the reason of their processing this invaluable human body. In this era of kalyuga where maya prevails, she has emerged as a sparkling light of spiritual counselor. She is a perfect example of a detached soul who never aspires for wealth, name and fame. She delivers spiritual discourses selflessly and has no desire in return of the invaluable preaching of Krishna she delivers to the masses. Her belief that maya is illusion is deep rooted and she is a standing pillar of this notion. She has written a voluminous book named ‘Raseeli Braj Yatra’ after an intense and deep study of Braj and the beatific Leelas of the divine duo Radha-Krishna. The book is a unique one and it does require great caliber for compilation which is not possible for an ordinary human being to accomplish. The importance of Braj is so beautifully explained in it that it has become an extraordinary epic for Brajwasi and devotees. She has continued her study about Braj and a second compilation, wherein more detailed study about Braj is supposed to be portrayed, will be published soon. The blissful conduct of Murlika Sharma is a testimony to her understanding about the Almighty. It is now an established fact that she is no ordinary soul and she has taken birth to throw light on spirituality and help people to have access to this invaluable venture for uniting with Krishna.